by the webmaster of said site. Openers and closers done on all windows, winshade mode completed, positioning bars for vol and balance added. 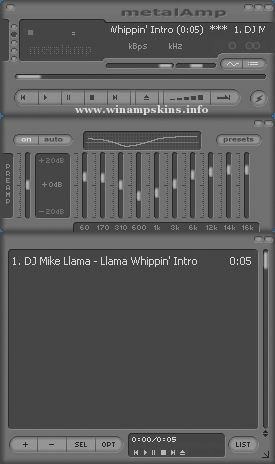 This readme file added.EQ sliders added, playlist buttons added, EQ graph edited to remove preamp bar. MB and AVS skinned, titles placed on each window, slider bars for volume and balance added at great trouble, is it worth it for 10 pixels i ask myself?. Easter egg added, winshade mode started. further work on joining windows together with neon , linked all windows on one common image, play list buttons imaged over, replaced with single pick up points. Titles placed on Playlist window and EQ.